1. Ceramic Pineapple: I can't get enough of the pineapple trend! I never met a pineapple I didn't like, and I love the two tone white/gold of this one. It's a great size and a perfect decor piece! 2. Coffee Table Book: this is my all time favorite decorative book! It's under $15 and it's great to stack as decor or keep on your desk. 3. Gold Tray: I found this exact tray at Home Goods a few weeks ago, and it was MORE expensive there than it is here on Amazon! 5. Acrylic Organizer: my love for acrylic pieces isn't going away any time soon! This is super versatile and there's a ton of different sizes at different price points; they're great for storing make-up, or even desk accessories in a pretty, organized way. 6. Glittery Pens: I have these pretty pens in a fun pen holder on my desk and they're gorgeous but they also write really nicely! They last a long time and there's other colors to choose from as well. 7. Trinket Dish: these pretty catch-all trays are perfect for your desk - to put your rings in, extra paper clips, etc. This one is so pretty and seriously SO cheap! 8. Gold Vases: mix and matching vases makes any room look so pretty, but when you love to fill a room with fresh flowers like I do - extra vases really come in handy! When they aren't filled with flowers, they look pretty placed alone or together and you can even use them for pens, faux flowers or as decor. 9. Faux Floral Arrangement: these faux flowers can be really expensive, but these are affordable and super chic! I love the colors and the pop of fun it adds to my office. 10. Pineapple Book Ends: I mean, do these really need an explanation?! They're SO cute and so fun! You could use these for more than book ends too - endless possibilities! 11. Gold Scissors: a good pair of scissors are great to have, but I really love how chic these are and the way they look on my desk/in a stationary holder! 12. Office Desk: this is my favorite desk of all time - it's simple and pretty but a great size and holds so much. I love the X-legs and it's under $200!! 13. Gold Pouf Ottoman: I like to be comfortable when I work, and this serves for the perfect foot rest, ha! ;) It's super pretty, doesn't take up much space and again, is another versatile chic piece for your office. You really can't beat it if it's from Amazon! I love chic office spaces - what's your favorite office piece? I love the way you write! It makes me feel just like I'm reading a message from a friend :) I love the layout of your page too! It's so welcoming and beautiful! What a great roundup! My house is white and gold with pops of color, so I could literally take all of these things and import them into my home office haha. I'm dying over the pineapple. Everything you picked is soooo cute! That clear organizer is brilliant... you can see what you put in each container lol. I'm the kind of person who "puts stuff away" and "organizes" and then forgets where I puti t.
I love that gold pouf! So cute! I love all of these! Especially the pineapples. I like your basic idea of making your work space a pretty and functional space. All the white and gold is not my style but gives me ideas to make my space my own. 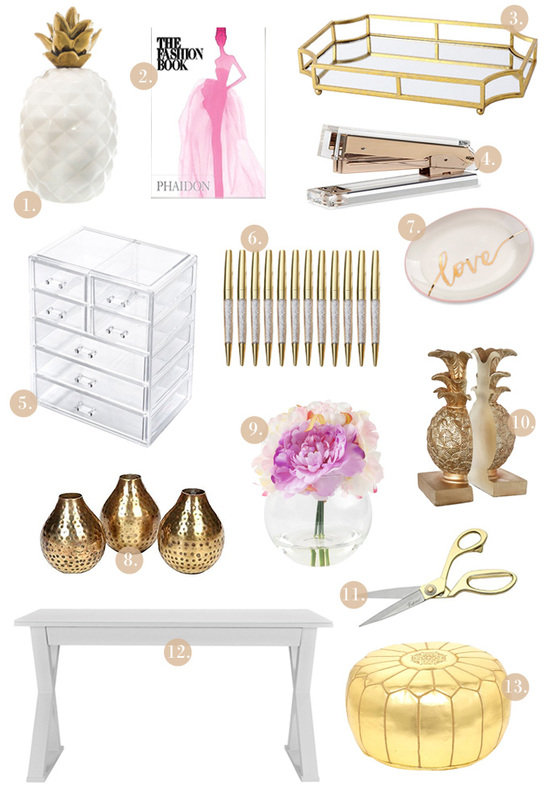 Love, love, love gold desk accessories! Having an office with these items in it would be so inspiring! I love your choices. Such fun picks! Office decor (well, decor in general) is my fave! Those pineapple bookends are my fave! Love all of your picks! And Amazon is so tricky that way, they're TOO easy to shop sometimes, lol. I've been in love with pineapples lately and gold. So I really want those bookends! These are some super cute office accessories. I really like the look of the pineapple bookends. I love these items, especially the desk, pens and scissors. Very stylish. I love that gold tray and thanks for letting me know I can get it cheaper on Amazon. The desk is gorgeous too. I'm in the middle of turning a bedroom into a home office and I love that desk. I love all the pineapples you picked out! 🍍 They are one of my fave accessories to decorate with. I'm thinking of re-doing my office and I'm pretty sure I need all of these things! Great roundup! I love anything gold! Oh, how pretty. I too love gold, but own very little. It's not something that I spend money on. I am WELL aware of the dangers of Amazon! lol I do a lot of shopping there, it is just so easy and the prices are usually good. OMG, these are available on Amazon??? I'm so in love with all of these. I've been meaning to makeover my home office and add chic accessories and I don't have many local stores to shop in for this stuff so I'm over the moon that I can get these things online!! Totally added those pineapple bookends to my wishlist! Such adorable picks. These are great items! I love that desk though. Simplistic enough that you don't want to crowd it with junk. I love the Acrylic Organizer and would use it for my jewelry. I also love the white desk as it is super chic and a great for my kids to do homework. Amazon has great things all the time. What cute choices! I really love that trinket holder. I need one of those for my random stuff that ends up all over the end table. I love to shop on Amazon. I always find a great deal on what I am looking for. I love that stapler it looks so pretty. I loved all the products just because they look beautiful. The color is amazing. Love the combo of gold and pink. I need one of everything pronto. What a fantastic list of goodies!! Wow everything is so pretty! Would love to have these in my home office!! I am obsessed with the pineapple book ends! So cute!! Love all your pieces. They are elegant. I'm loving the trinket dish but my favourite is the pineapple book ends! I love them! I love all of these! That desk is a must because I'm looking for a new one and the pineapple book ends are absolutely darling. Amazon?? Wow - so yes, now this knowledge is a little dangerous :) I love the pineapple bookends and the gold pouff! How pretty for an office! I love them all, especially the faux floral arrangement. Yeah, Pinterest and Amazon can get me in a whole lot of trouble! How crazy is it that I have these acrylic organizers already in my cart??! I'll take this as a sure sign that I should just push the button, Ha! Love all these cute accessories. So many cute items! How can I just choose one?? That pineapple caught my eye! That is something very unique, and I don't think I've ever seena anything quite like it. These are some awesome office items from Amazon. Amazon is a great place to shop for almost everything that is why it is my favorite place to shop. Thanks for sharing these items. I love the gold handles scissors. I love that office desk. It looks wide enough to keep all my stuff in one place. The gold ottoman would really be cool to have in my office too. I literally love everything you picked out here! It all goes so well together too! I think my favs are the gold mirrored tray and the gold pouf! I literally want every single thing...haha! I have a gold ottoman in my office and it's the BEST! Love all of these, pops of gold are always so pretty! wow who knew Amazon had so many cute accessories! I totally need that acrylic organizer! I need all of the pretties to make my office more chic! Love your picks! I didn't know that Amazon had half of these! They're beautiful.. and I want my future office will definitely be gold and white all over! These are amazing picks! That acrylic organizer is amazing! I definitely want one for my desk! I love this! I have that desk and I love it!! Those are all amazing pieces! I use Amazon all the time and never thought to get cute items like that from there! Anything that is white and gold, I love!! Amazon in seriously the best, it always have amazing prime shipping and amazing prices! 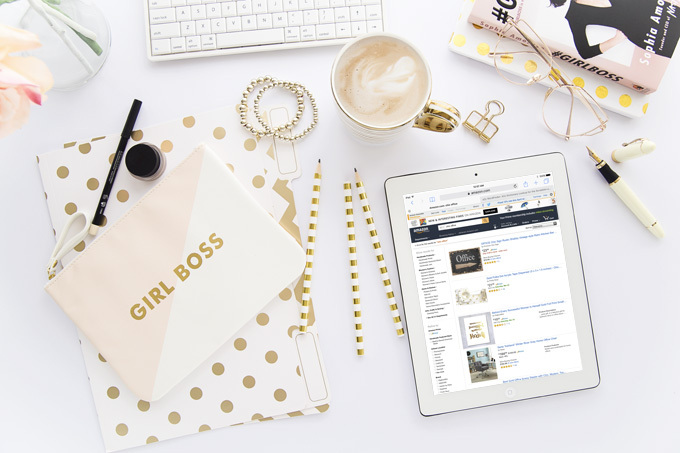 I love cute office accessories and I love Amazon so this roundup is perfect haha! Love everything on this list! You have chosen some really nice items. I am redoing my craft/office now. Will keep these in mind for sure.